Louis Nelmes - meherbabatravels jimdo page! Spiritual Aspirant - there is no known image of Louis. 1923 - Quetta, Br.India. 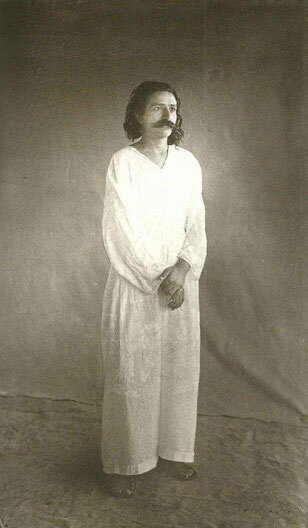 This is how Meher Baba looked when Louis first met him. During the last week of December 1923, Baba went to Poona for a couple of days and stayed at Sadashiv Patil's house in Kasba Peth. In a splendid mood, Baba held his largest public darshan; hundreds came for his blessing. Babu Cyclewalla brought a British seeker named Louis Henry Cox Nelmes. At the moment of seeing Baba, Nelmes, a Christian by faith, was stunned and thought he was beholding Jesus Christ himself! He became speechless as he gazed at Baba. Tears welled up in his eyes. He stood before Baba for a long time, then bowed and took his darshan. Within moments, his heart accepted Baba as his Lord with full faith and love. After the darshan program, Baba met with Nelmes in private and asked what he wanted. Nelmes replied, "I have seen you as the Christ! I want to be at your feet forever!" Baba consoled him, telling Nelmes he would send for him at the appropriate time, but until then he should remain in Poona. Baba went to Poona by the evening train with Jamshed and a few others. 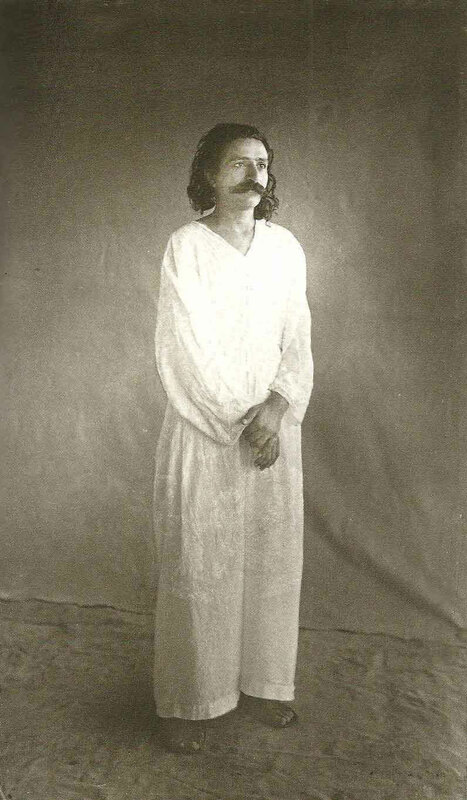 An Englishman named Louis Nelmes had met Baba in Poona during December 1923 and had requested to stay at his ashram. Baba told Nelmes that he would be sent for at the opportune time. On Friday, 19 June 1925, Baba held darshan in Poona, and Nelmes again came to meet him. During this occasion, Nelmes reiterated his desire to stay with Baba, and this time Baba agreed. Baba and the men returned to Meherabad late the same night, and Nelmes came the following morning. He was the first Christian to join Baba's mandali. Nelmes, 29, was born and grew up in Bombay. He was from an upstanding family. His father was a British police inspector and had met and married his English wife (a nurse) in Bombay. They had five children. Louis was the youngest. Nelmes was working as a measurer at the Bombay Chamber of Commerce when he married Ellen Nolan in Bombay in 1919. They resided in Byculla and had two children. Nelmes was extraordinarily good-natured and had a great love for spirituality. As a young man, before ever seeing Baba or hearing his name, he had had a vision of the Master once while in a cathedral. 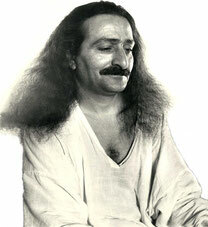 While praying, he looked up at Jesus Christ's picture and saw Meher Baba's face before him. After meeting Baba for the first time at Sadashiv's house in Poona, Nelmes vividly recalled the vision which he had experienced years before. Upon his arrival at Meherabad, Nelmes lived with the mandali and mingled with them quite naturally. Pendu was especially fond of him. Although British in his habits, Nelmes would eat the same food the mandali ate and was always prepared to do any work. Against the mandali's advice, he would insist on doing the heavy work of carrying water from the well, balancing the containers over his shoulders on a long bamboo pole. In those days, the mandali had blankets made of two gunny sacks sewn together like a sleeping bag, and each had only this covering at night. Nelmes, too, accepted this meager protection and did not wish for anything more. He was enthusiastic about the ascetic austerity and easily became vegetarian, eating bhakri and drinking milkless tea like the other mandali. On 4 July 1925, handmills for grinding grain were obtained and fixed in a separate room, and the men began grinding their own millet for the bhakris that were served for their evening meal. Baba named the following men to work the mills at fixed times each morning, from 7:00 to 9:00 A.M.: Arjun, Bapu Brahmin, Bapu Gahile, Behramji, Maruti Patil, Mohan Shahane (Kaka's son), Nelmes, Eruchshaw Irani (a young man from Bombay), Vishnu, and Rustom. Baba fixed his own time for working at the mill and began doing it, at first for one hour and then for two hours each morning. That morning, Baba had become annoyed with his young attendant, Bal, and appointed Louis Nelmes to take his place for the day. This was a ruse on the Master's part. Nelmes' health had weakened during the month he had been staying at Meherabad, because of the austere diet. In addition, for the past several days, Nelmes had been suffering from a septic wound on his leg and had been receiving treatment in the hospital. During the next three days, Nelmes' condition worsened. Baba himself complained of a backache and had a high fever. On the night of 26 July, Nelmes, too, had a high fever. When Baba observed him, he remarked, "Nelmes will be free of all pain by tomorrow morning." Pendu and Padri nursed him the whole night, but Nelmes expired the next morning ( 27th ) and, true to Baba's words, was relieved of all suffering. Baba had become so annoyed with Bal and chose Nelmes to serve in his place so that Nelmes would have the opportunity to be by Baba's side continually near the end of his life. As Age noted, "The Master is God and eternal love in human form. Can anyone fathom the depth of his compassion?" After the police and the civil surgeon were summoned, Rustom brought a coffin and Nelmes' body was taken in a truck to the Christian cemetery near Bhingar, Ahmednagar where his final rites were performed. A few of the men mandali attended the funeral. Meanwhile, Baba fasted the whole day and did not even drink water; he attended to his usual chores, which included cleaning the Jhopdi and sweeping it and the verandah. When the mandali returned in the evening, Baba remarked, "Although Nelmes has left his physical body, his mind is still alive. Very soon this mind will take another suitable gross form, and he will definitely come in my contact again." 1927 - Ahmednagar, India. 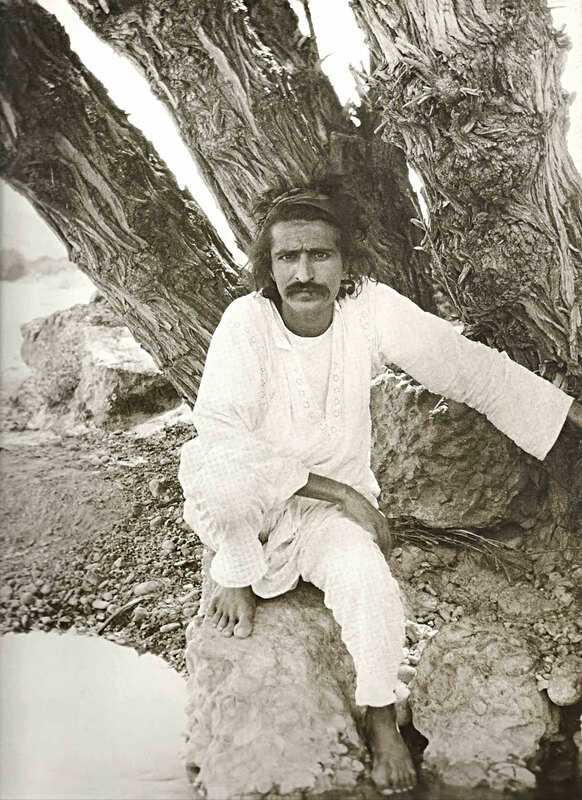 This how Meher Baba looked when Louis passed away. Adi reported the news that Sadhu Christian Leik had recently expired. Leik had returned from his tour of India on 16 October in an emaciated and debilitated condition and stayed at Akbar Press. 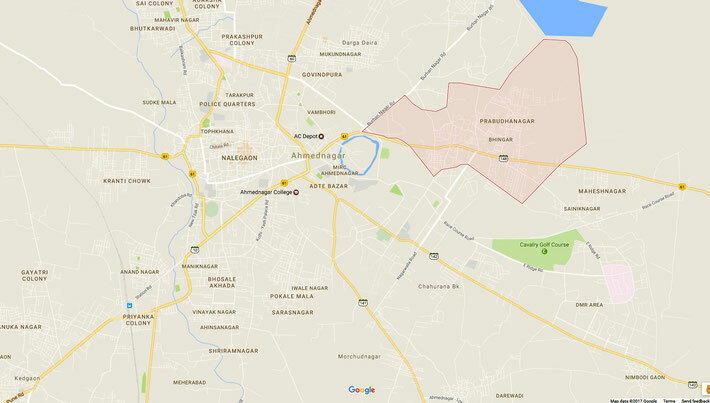 He was moved to Meherabad two days later, seriously ill and extremely weak. He died at 5:15 P.M. on 29 October, and was buried at ten the next morning in the Christian cemetery in Bhingar, Ahmednagar (the same one where Nelmes was buried). The area shaded in rose in where the cemetary is located. Exactly where in this area is unknown, presently.